Happy New Year to you if we’ve not yet spoken! As this is our first blog post of 2015, we thought we’d take the opportunity to review last year… 2014 was certainly a busy year, and you’ll see from the sample below the scale and breadth of projects that we covered. We’re looking forward to seeing some of these plans come to life in the next few months. 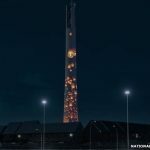 National Lift Tower, Northants: We have been advising on a project to illuminate the National Lift Tower in Northants, making it look like a ‘giant lava lamp’. The Tower has the potential to be Northampton’s answer to the Angel of the North. The tower itself is an interesting building, Grade II listed and the only lift testing tower in the UK. The proposals are at a very early stage, but you can find out a bit more about the project here. Premier Academy, Milton Keynes: Any parent who gets involved in the gridlock around school at pick-up and drop-off time will no doubt appreciate any efforts designed to make the roads safer and easier to navigate. This was the case at Milton Keynes’ Premier Academy (formerly Eaton Mill Combined School). The school had only one access for cars, which was on the bend on a cul-de-sac and the school has sought planning permission for a one way system, leading through the Academy grounds and out onto another road. After a long process lasting around 8 months, the planning application was refused by Milton Keynes Council. That’s when Apex Planning Consultants was called in to handle the appeal case. We provided a strategy for addressing the three reasons given for refusal, and also oversaw a Statement given by a highway consultant, as well as producing our own appeal Statement. The appeal was a long, convoluted affair, but it ended with planning permission being granted and a partial award of costs against the Council, further reinforcing the convictions of the Academy’s case. Simply Race, Stacey Bushes, Milton Keynes: A gaming business where customers get to drive virtual racing cars on tracks from around the world was another business that we assisted during 2014. Simply Race will be located on the Stacey Bushes Trading estate in Milton Keynes. This location is deemed to be acceptable for offices, general industrial and warehousing businesses but Simply Race is a leisure use, which should, according to the Council, be primarily located in town, district or local (retail) centres. Our task was to prepare a planning application that justified the business’s location. We also negotiated with the planning officer – and permission for change of use was granted. Simply Race should open this month. Find out more at simplyrace.co.uk. Mina House Hotel, London: The owners of Mina House Hotel, a Grade II listed building close to Paddington Station had undertaken a lot of unauthorised works to the hotel without listed building consent. The owner’s architect had tried to regularise the situation with Westminster City Council but when he failed he asked us to help. We introduced them to an architect and heritage consultant local to Milton Keynes and then entered into pre-application discussions with the Council. We were able to prepare the listed building application and to justify works to the heritage asset, finally obtaining listed building consent. British Red Cross, Chelmsford, Essex: The British Red Cross (BRC) is a regular client and its latest project is the most complex, requiring the change of use of a listed office building to two dwellings, the demolition of a 1970’s extension to the listed building and also used as an office, and the erection of an office building with storage buildings. We used a local heritage consultant and prepared and submitted the requisite applications. Planning, listed building and conservation area consent was duly granted. Planning objection, Towcester: A couple living just outside of Towcester were not happy when it was proposed that a large storage building and ménage be built at the rear of their home. We advised them about the areas of objection most likely to carry weight when determining the application and prepared a written objection on their behalf. We prepared a presentation and gave this to the Planning Committee reinforcing our clients’ objections. The Planning Committee agreed with our objections and cited them when refusing permission for the application. Bungalow planning permission, Olney: When a client had permission for a bungalow to be built at the back of their existing house in Olney refused, we reviewed the reasons for the refusal, believing that Milton Keynes Council was being unreasonable. We worked with the architect of the bungalow, and used the services of a highway consultant to prepare a report supporting the proposal. We then submitted an application, along with a Planning Statement arguing why the development should be allowed. There was a lot of negotiation involved, but eventually this was yet another plan that was approved. It’s been an eventful year, but we are pleased to have been able to offer valuable help and advice to many clients needing assistance with their planning applications. If you would like to discuss your own project with us, or find out more about what we do, please visit the website at www.apexplanning.co.uk or drop us a line at info@apexplanning.co.uk, without obligation.